At this site approximately 4,500 years ago, Wisconsin Indians gathered to bury their dead. Because of their use of copper tools, weapons and ornaments, this group became known as the Old Copper people. They fashioned spearpoints, knives and fishhooks from pure copper nuggets that may have been transported from mines as far away as Isle Royale in Lake Superior. Through a process of heating and hammering, the nuggets were made into tools and various other objects. Old Copper people lived by hunting game, fishing, and collecting plant foods. They interred some of their dead in graves and cremated others in pits. Implements of copper, stone, bone and shell were buried with them. 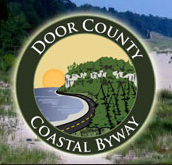 This particular site was excavated in 1952 by the Wisconsin Archaeological Survey and the Oconto County Historical Society. 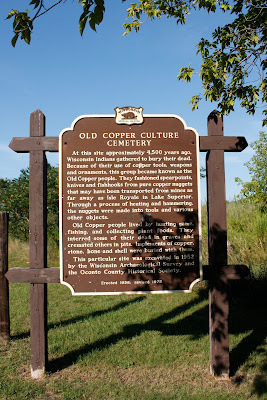 The marker is located inside Copper Culture Mounds State Park, at the end of North River Road / Copper Culture Way, at the end of a parking lot, at 260 Copper Culture Way, Oconto, Wisconsin 54153. NOTE: Even with accurate GPS coordinates, I had a very difficult time locating this marker. TomTom took me on quite a wild goose chase. Be sure to check the Google Map link before heading out to this marker, if you're not familiar with the area. Burial ground of North America’s earliest metal users, the Oconto Site is the oldest dated cemetery in eastern North America. Museum is open to the public summer weekends. Foot trail leads from parking area to stone monument at location of burial ground. Wisconsin Historical Marker, National Register of Historic Places, 1966. 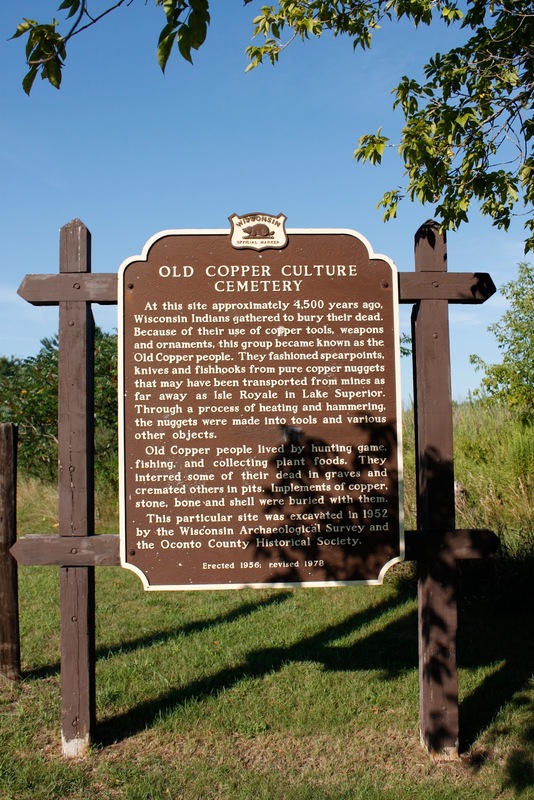 Old Copper Culture Cemetery (the "Oconto Site") is a Registered National Historic Landmark. Copper Culture Museum, just past entrance to the park. Marker is at the end of the driveway. 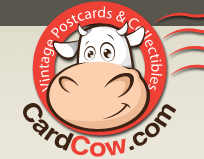 is a Registered National Historic Landmark. Entrance to Copper Culture Mound State Park. It's a beautiful location! And the history so interesting!